Writing folders for each child with resources fastened in the center brackets and work in progress in pockets. Store folders in a labeled tub or file in the writing center. Children should be able to easily find their names, clearly printed at the top. 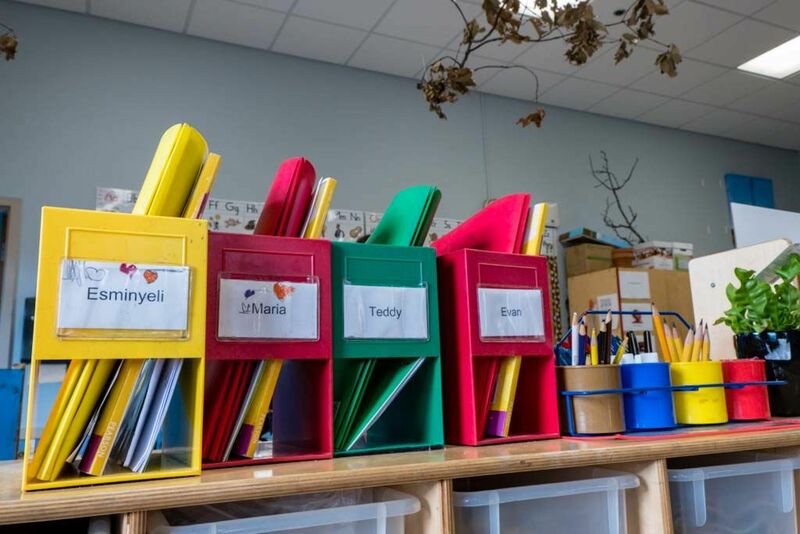 We suggest using four different colors for folders as children can find theirs easily, or four different children can distribute them at writing time. A basket for reader’s notebooks. You might place four different color stickers on the upper-right corner and have students place them in four baskets. They can access them more quickly and you can review a pile with a particular color each day. From Guiding Reading: Responsive Teaching Across the Grades by Irene C. Fountas and Gay Su Pinnell. Copyright (c) 2017 by Irene C. Fountas and Gay Su Pinnell. Published by Heinemann.